Oil States’ Puma connector, designed to meet the flush O.D./I.D. 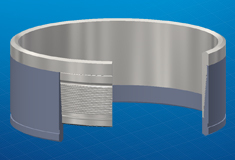 needs of operators, offers a threaded, weld-on connector solution for applications where diameter restrictions preclude the use of conventional upset connections. The Puma connector is drivable and reuseable. It exceeds the pipe body yield capacities while using standard pipe grades. Installation and makeup utilize standard casing running equipment without the need for specialist threaded running tools. Double abutment faces reduce pile-driving loads through connector threads. Handling is offered via elevator groove in connection box with removable load ring for standard side door elevators. Tested to ISO 13679.2 Cal1 with bending and pile testing. See Puma DF Connector animation here.